Four more bodies have been recovered from the Java Sea as the hunt to find the main wreckage of AirAsia flight QZ8501 enters a second week. Indonesia search and rescue chief Bambang Soelistyo said 34 bodies have now been found, as well as five large objects. Bad weather has forced divers to suspend their bid to find the plane’s fuselage, where most of the bodies are believed to be trapped. 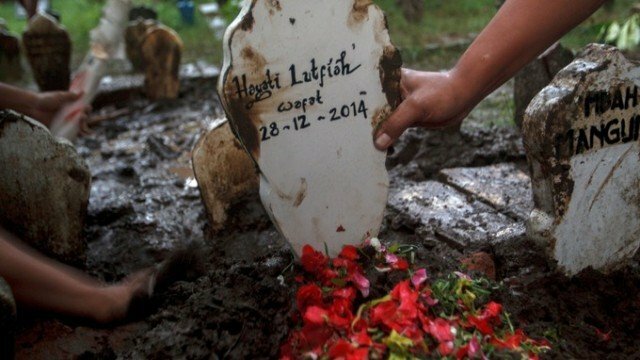 The plane, which was carrying 162 people, crashed on December 28. It was en route from Surabaya in Indonesia to Singapore. Bad weather is believed to be the biggest factor in the crash although the Airbus A320’s “black boxes”, or flight data recorders, have yet to be located. Bambang Soelistyo said on January 4 that Singapore navy vessel RSS Persistence had recovered one body, while US navy ship USS Sampson had brought three more back to the Indonesian town of Pangkalan Bun. Nearly 30 ships are now involved in the search operation, as well as six planes and 14 helicopters. There were hopes the weather would improve on Sunday, but conditions once again hampered efforts to find the plane’s main wreckage. Search teams found four large objects thought to be debris from the plane on January 3, with the largest measuring 59ft. A fifth object was located on the seabed on January 4, Bambang Soelistyo told reporters. Dozens of divers from Indonesia and Russia have been deployed to the search area, which has been enlarged to allow for tides sweeping bodies and debris further afield. They attempted to survey more of the seabed on Sunday but “visibility at the sea bottom was zero,” Bambang Soelistyo said. Remotely operated cameras were being used to try to photograph the objects, but waves up to 16ft high and strong currents made their use difficult. On January 3, Indonesian weather agency BMKG said initial analysis suggested icy conditions in the air had caused the engine to stall. Officials have said the plane was travelling at 32,000ft when the pilot’s last communication was a request to climb to 38,000ft to avoid bad weather. It has emerged that AirAsia did not have official permission to fly the Surabaya-Singapore route on the day of the crash, but was licensed on four other days of the week.